National Database & Registration Authority (NADRA) has gained international recognition for its success in providing solutions for e-governance, identification & secure documents. National Database and Registration Authority (NADRA) was established as National Database Organization (NDO), an attached department under the Ministry of Interior, Government of Pakistan in 1998. NADRA is one of the best registrations Authority of Pakistan and it also providing Multi-Biometric e-Passport solutions for Pakistan. You can check now any id card by NADRA CNIC confirmation online method and complete detail given here. 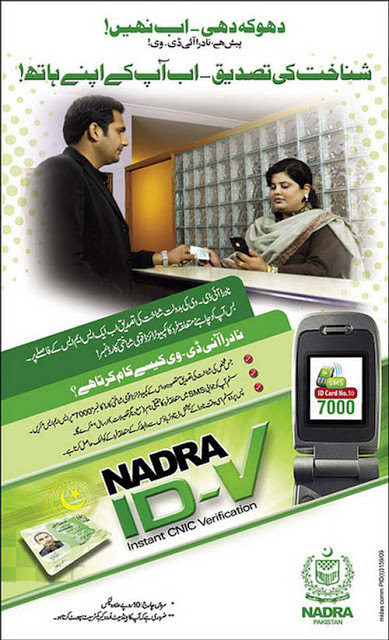 Nadra is also providing Nadra e-Sahulat. NADRA has offices in all major cities of Pakistan. For registration of your NIC or ID card visit your local NADRA Office or download form from NADRA site. In-depth Research and Development efforts have enabled NADRA to become the trailblazer in the areas of Software Integration, Data Warehousing and Network Infrastructure. Through this system you can get information here about passport or NICOP and CNIC. NADRA has largest database of Pakistan citizen and this all is confirmed data. In this page we are going to share with you to check your CNIC through sms. You can easily find the bio-data of any CNIC number & you can find CNIC number bio data using the CNIC number of any person in Pakistan from your mobile phone. You get get all latest updates about Nadra online free from here. There are many other ways to find bio data using CNIC, these methods will be published later on our website. Step 1: Go To Messages Option In Your Mobile Phone. Step 2: Go To Write Message. Step 3: Type CNIC Number without Hashes. Write CNIC Number without dashes and send it to 7000. In response you will get name and father’s name of that particular CNIC number holder (in Urdu fonts). For Example: Write NIC # 1234567891234 and send to 7000 from your Cell phone. At the moment, this service is available for Mobilink, Telenor and Warid customers while Ufone and Zong are in the process of getting listed. This service will also be helpful to law-enforcement agencies as they may be able to get more details as compared to public because there is another special number for them. They can get CNIC information by sending the number at 7001. Reply will be received in less then 30 seconds via SMS message & Message containing full information Name S/O Name OR C.N.I.C Number with CNIC Registered Address. National Identity Card (NIC) is issued to the citizens of Pakistan. It is a blend of state-of-the-art technology and well-defined business rules to guarantee its authenticity and validity. Every citizen of Pakistan, 18 years and above, is eligible for NIC. The unique 13 digit identification number is recognized all over the country. It is the first requirement of individuals as it is mandatory to obtain documents like license, passport, NTN, bank account, cellular connection etc. Certificate : If you need a Certificate for Child Registration, Family registration by birth, marriage and adoption or Identity Card Cancellation, please select this option. Card : In case you are looking for your National Identity Card, please select the card option. You can apply for your NIC by either visiting NADRA Registration Center (NRC) or through Pakistan Identity website. You should visit Nadra office and first You will be issued a token & then Your photograph will be captured or fingerprints and signature will be taken. Your required data entry will be done and form will be printed to be reviewed by yourself & then will be handed over a printed version of your application form. Submit this form after confirming the printed information & attestation by a gazetted officer.